BOGE KOMPRESSOREN Otto Boge GmbH & Co. KG. is one of the worlds leading and most valued companies in Europe. BOGE KOMPRESSOREN Otto Boge GmbH & Co. KG. Headquartered in Germany. BOGE represents more than 110 years of experience. For decades, the company have combined the principles of dynamic growth with Intelligent engineering, innovative solutions and quality. Otto Boge founded the company back in 1907. After World War 1, Otto made a name for himself producing specialty tools for the emerging car industry and motorbikes. Finally, BOGE became a specialist manufacturer of compressors and compressed air appliances and a worldwide leading provider today. 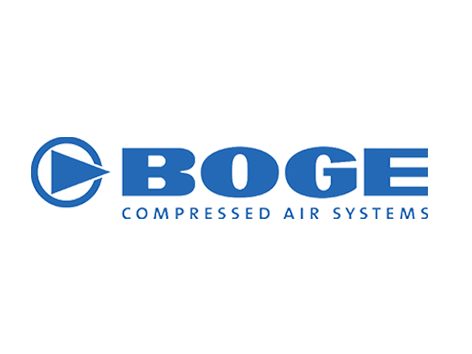 With more than 100 years of experience, BOGE produces all types of air compressors. It offers a wide range of compressors (4 -400 KW). The company produces screw compressors, piston compressors oil free or oil injected with compressed air treatment solutions. Compressed air systems are used in a diverse range of industries and in many different ways. Quality and purity vary according to the area of use as different standards apply for different industries and medical applications. ATE is BOGE’s sole provider in Egypt which gives us a great edge in the market.